All dressed animal art, also known as animal character art, is "anthropomorphic." This big word actually has quite a simple meaning: "the attribution of human motivation, characteristics, or behavior to inanimate objects, animals, or natural phenomena. The term derives from the combination of the Greek words ánthropos (human) and morphe, (shape or form)." This illustration - "The Interrupted Feast" by Racey Helps - is a perfect example. 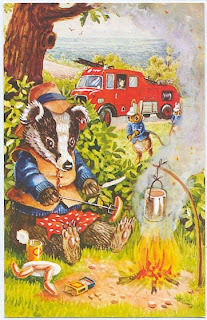 As badger cooks up little campfire meal of sausage links, the smoke and flames from the fire bring the local Fire Department (comprised entirely of bunnies) running! It's humorous, colorful, sweet, and fun, and a great example of mid-20th century anthropomorphic, or dressed animal, art. If you'd like to see my own anthropomorphic art, Whimbletails™, please click here. 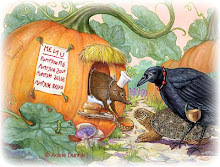 To visit my online store featuring a large variety of great products, gifts, and collectibles featuring all my whimsical animal illustrations, please go to Adele's Cute Animal Art Shop. Here are two illustrators who excelled at what is known as "dressed animal" art. They both specialized in dogs who are participating in human activites, primarily pool, cards, and, in the case of Sarnoff, golf. I've shown them together due to their strong similarities. (Sarnoff was directly inspired by Coolidge.) Remarkable for their detail and humor, prints by both artists remain extremely popular even today. The top two paintings are by Coolidge; the bottom is by Sarnoff. Here's a little more about each artist. Cassius Marcellus Coolidge (1844-1934) was an American artist known primarily for his Dogs Playing Poker paintings and inventing the concept of life-size cutouts into which one's head is placed to create funny character photographs. While he had no formal training as an artist, his natural talent for drawing led him to create cartoons for his local newspaper during his twenties. 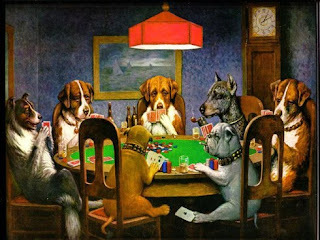 In 1900, Coolidge contracted with the advertising firm of Brown & Bigelow of St. Paul, Minnesota to create sixteen oil paintings of dogs in various human poses, nine of which depict dogs playing poker. They quickly became a national success and finally earned him, at late mid-life, fame and fortune. 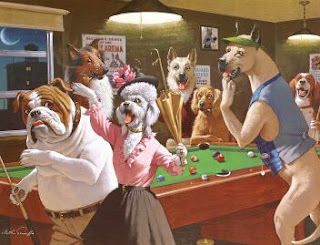 His anthropomorphised dog paintings have inspired not only American illustrator Arthur Sarnoff, who became famous for his Dogs Playing Pool series of paintings, but also hundreds of other imitators. In 2005, two of his paintings, "A Bold Bluff" and "Waterloo", sold at auction for $590,400, a record for Coolidge, whose previous top sale was $74,000. Arthur Sarnoff (1912 - 2000) was an American artist who studied at the Industrial School and the Grand Central School of Art in New York City. He was a student of John Clymer and Andrew Wyeth. Sarnoff was a member of the Society of Illustrators and exhibited widely including at the National Academy of Design. While he did extensive commercial work for weekly magazines and his art appeared in a variety of advertising campaigns, he became equally known for his pool playing, card playing, and golfing dogs. 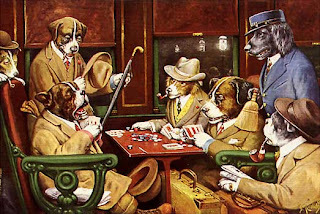 Although his best known work is a painting of dogs playing pocket billiards entitled "Jack the Ripper", another called "The Hustler" was the best-selling print of the 1950s. 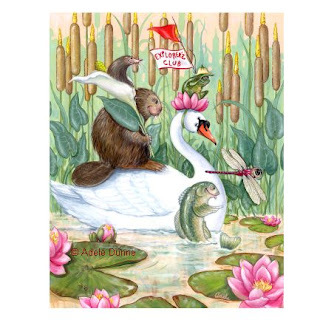 To visit my online store featuring a large variety of great products, gifts, and collectibles featuring my own whimsical animal illustrations, please go to Adele's Cute Animal Art Shop. Animal art doesn't have to be just paintings or illustrations! 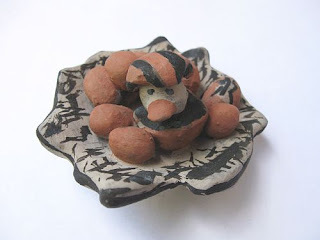 It can also include other forms of expression like this wonderfully creative bird's nest clay sculpture by the very talented 10-year-old, Dominique Reano of Santo Domingo and Cochiti Pueblos, New Mexico. Can you see why she won both a Youth Pottery Award and the Youth Smile Award at this year's Indian Market in Santa Fe? Birdie even seems to have a piece of shell stuck upon his little head. Cute, cute, cute! 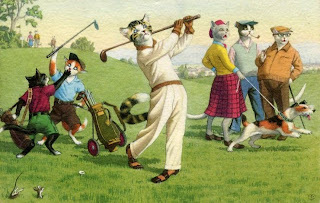 From the 1940s through the 1960s, the Alfred Mainzer Company of Long Island City, NY published a series of linen and photochrome humorous cat postcards illustrated by Eugen Hartung (or Hurtong) (1897-1973), sometimes referred to as "Mainzer Cats". These postcards normally illustrate settings that are filled with action, often with a minor disaster just about to occur. While the dressed cats were by far the most popular and most plentiful cards, Hartung also painted other dressed animals - primarily mice, dogs, and hedgehogs. The cards of this series were first printed in a continuous tone by Max Kunzli of Switzerland. Typically, the Kunzli cats are featured in European settings and the cards are not as brightly colored as the American editions. Later cards were printed in halftone lithography in a variety of countries, including Belgium, Turkey, Thailand, and Spain. 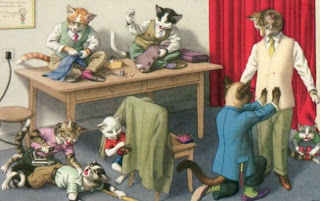 Alfred Mainzer, Inc., still exists, and recently published a new collectors' set of 126 dressed-animal postcards which includes 118 dressed cats, 7 dressed dogs, and 1 dressed mice postcards. My own feelings about the dressed cat paintings of Eugen Hartung? Sorry to say, definitely mixed. On the one hand, they are beautifully composed and skillfully executed. He obviously possessed a massive amount of artistic talent. Great time and care were taken with every painting - the detail is a sheer delight, and is the thing most quoted as a favorite characteristic of Hartung's dressed cat paintings. And perhaps their best feature is their action, humour, and suspense - every painting without exception tells a story, which is key in creating a successful work of art. They are without a doubt a joy to behold. On the other hand, however, I can't look at his work without seeing paintings of PEOPLE. Being an artist myself, I sense he often worked from photos of people individually and/or in groups in action poses, and simply substituted cat heads for human heads. I think their human-style bodies are far too literal and an unsettling - even unnerving - contrast to their animal heads. Unlike Hartung, most other "dressed animal" artists will keep the NATURAL SHAPE OF THE ANIMAL. 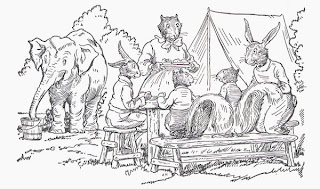 A mole by Beatrix Potter may be wearing a vest and spats, but he will still be shaped like a mole. The effect is more believable (if a dressed animal can be believable! ), more charming in its naturalness, and considerably less disconcerting than a body with human proportions and an animal's head. Quite honestly, Hartung's dressed cats kinda creep me out! I've posted two cards in which this seems, to me, to be especially evident. What do you think? Flickr Group "Animals in Your Art"
While George Carlson is perhaps best known for his work with the Jingle Jangle comic books, he had a long career illustrating children's books and authoring numerous guides to the art of cartooning. He appears to have begun his career about 1916, but it was during the 1920s that his work became widely known, with illustrations for "Jane and the Owl," "Adventures of Jane," "The Adventures of Toby Spaniel," and others children's books. In 1933, he authored "Draw Comics - Here's How!," a book of instructions, tips, and techniques for cartooning, followed by at least two other guides to the art of drawing comics. In 1936, he illustrated the dust jacket for the first edition of Gone With the Wind. A million copies of Margaret Mitchell's book were printed and sold, and Carlson's reputation as an illustrator was made. 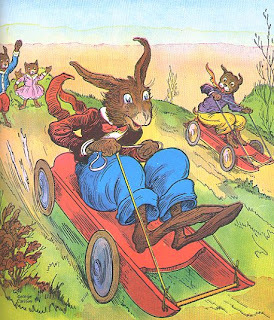 In 1939, he was recruited by children's publisher Platt & Munk to illustrate Howard Garis' classic series of Uncle Wiggily stories, of which he did at least a dozen. He continued this association Platt & Munk for years, illustrating numerous "Pastime Fun Books" - Fun-Time Games, Puzzles, Stunts, Drawings, Riddles, Mazes, and other pictorial challenges. During the 1940's and 50's, he continued to produce works along the same lines - guides to drawing, comics, and more Fun books. Carlson died in 1962.